Robotics I is for beginning robot designers. The students are placed in small groups according to age and ability. 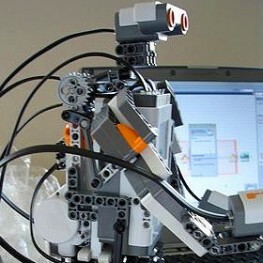 They are introduced to building and programming Lego Mindstorms robots that have human-like capabilities such as following sound commands, talking, lifting objects, and much more. They will learn the basics of programming robots, but will focus on building and testing their own completed robots. In Robotics II students will build more advanced robots and focus more on learning the programming language. The robots will be tested on various challenge courses. Troubleshooting skills will be incorporated daily. The camp is available for students who had previously participated in our Robotics Summer I Camp or in our After School Robot Club. Robotics III is the perfect camp for students who wish to train for the FIRST LEGO League competition or for students who would like to join us for the 3rd week of Robotics. Students will design and build robots to follow competition requirements. This is the camp where all the building, programming, and designing skills reach an advanced level. Critical thinking skills and teamwork will be incorporated into these challenging, hands-on activities.